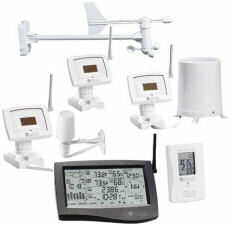 The WMR968 Complete Wireless Weather Station is Oregon Scientific's most full featured weather forecasting station. It's an affordably priced, professional level system. The WMR968 weather station comes equipped with outdoor sensors that operate on solar power which ensures an easy and convenient installation. It also features seven channels and accepts up to three additional sensors. Equipped with a touch-panel interface for quick and convenient information access, it captures weather measurements from up to 300 feet away. You'll see the indoor and outdoor temperature and humidity, wind speed and direction, wind chill, dew point, heat index, barometric pressure and rainfall data. Oregon Scientific also manufactures the John Deere branded WMR968-JD weather stations. They are identical to the WMR968 except for the signature John Deere green finish on the main control unit. The Oregon Scientific WMR968 Weather Station is a great choice when you're looking for a high quality weather station for a very reasonable price. Browse the selection of discounted WMR968 wireless weather stations and accessories that are currently for sale on eBay - you simply won't find lower prices anywhere else! If you don't see what you need search here for even more weather stations.